Dolce Vita (Gina) is a beautiful grey mare by the Dutch stallion Sir Sinclair and out of our Keur mare Mystic. The quality of this filly is obvious beginning with her beautiful conformation. Highlights include a great head-neck-wither connection; a nice sloping shoulder & rounded croup, good bone & joints, and correct legs. She has very refined features and is a very good example of a modern Dutch dressage horse. Gina has a very sweet disposition, a good head and a willingness to please. She has the moves to go along with her good looks, as well. Gina shows plenty of suspension & hock action at the trot; nice cadence at the canter; and an exceptional walk with excellent reach. Gina has shown some talent for jumping, as well. That is not surprising though considering her lineage. She has several jumper 'greats' in her backgound; e.g., Nimmerdor, Ibrahim. Gina's dam Mystic was bred as an all-rounder and had Best IBOP in Dressage & Jumping in 1998. Her sire Sir Sinclair has a solid dressage career. He has scored as high as 87% at Dressage at Devon, was named National FEI Champion as a 6 year old and USDF FEI Horse of the Year. In 2006, Sir Sinclair was Champion at the Prix St. George Challenge in Lexington. 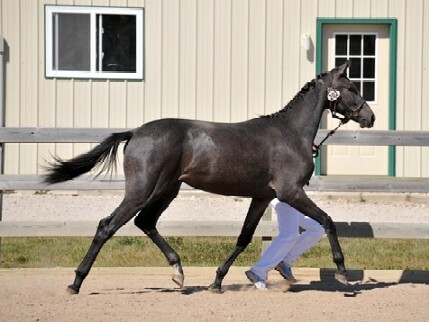 The result of this dam/sire breeding is a very athletic & elegant mare capable of a sport career in any discipline. Gina will be an outstanding addition to our existing broodmare lineup. Comments: "a fine example of the modern riding horse"; "one of the nicest yearlings inspected this year"
Keuring Report: "big framed, leggy youngster who showed suspension and suppleness"